The Retro Bin: The Super Globetrotters (1979) | TWINSANITY! Hello and welcome to a new segment on Twinsanity titled The Retro Bin, where we unearth a forgotten show from Toon Town’s past, examine it and basically tear it a new one. Today, we’ll be looking at a Hanna-Barbera “classic” from 1979, The Super Globetrotters. Look! Down on the court! Is it the 1992 Dream Team? Is it the NBA Hoop Troop?? NO! It’s the Super Globetrotters!!! Nate Branch became Liquid Man, who could turn himself into water. One of Saturday morning’s greatest mysteries is that if Nate was called Liquid Man, then why did he wear an ‘F’ on his costume? That bugged the heck out of me as a kid. Freddie “Curly” Neal became Super Sphere (aka Sphere Man), who could retract his limbs into his head to bounce, smash, and grow. Naturally, his head looked like a basketball. Hubert “Geese” Ausbie became Multi-Man, who could clone himself into into a seemingly infinite amount of duplicates to surround and mystify foes. He also carried around a shield which he never seemed to have use of. James “Twiggy” Sanders became Spaghetti Man, who possessed a body of living spaghetti which he could use his as a ladder, a rubber band or a rope. Louis “Sweet Lou” Dunbar became Gizmo Man (sometimes just Gizmo), who had an immense Afro which was a gateway to Hammerspace, containing an unlimited supply of gadgets (including one that fit the current situation). Sweet Lou’s particular power was so nutty that it later turned up as a visual gag in an episode of Comedy Central’s Upright Citizens’ Brigade. 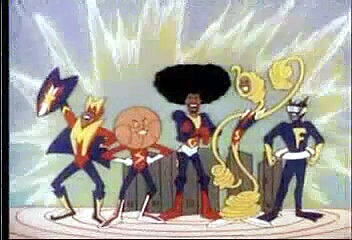 The team received their marching orders from the Crime Globe, a basketball-shaped satellite (voiced by Frank Welker) that would alert the Globetrotters of villainous activities and even give them strategies to fight them. -Wait, an HB show about a team of superheroes featuring a guy who can turn into water, a guy who can create copies of himself and a guy who can spring and stretch. That sounds kind of familiar…. 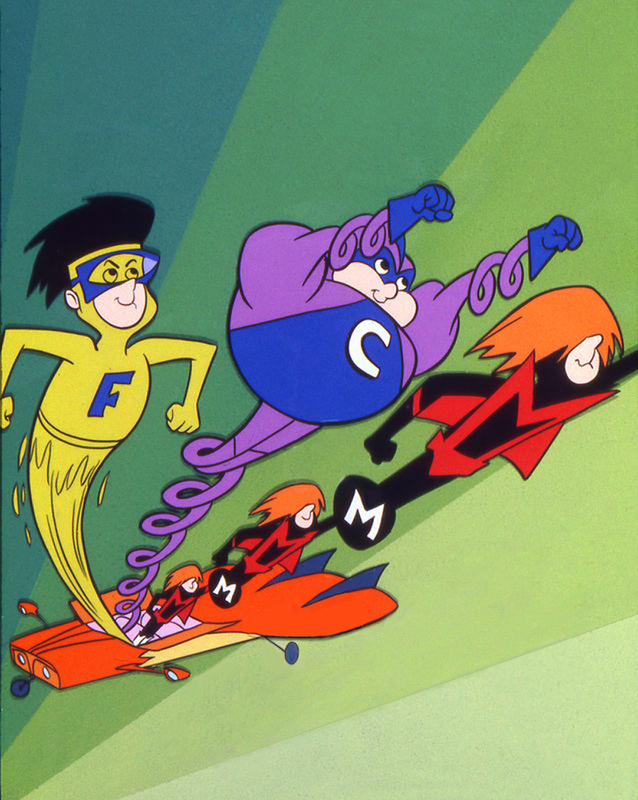 …Hanna-Barbera copying one of their own successful formulas? Nah, couldn’t be. They’ve never done that. The actual episodes typically blurred together, so it’s not really necessary to go into great detail about them. This opening pretty much sums things up. Crime Globe: (at the start of the match) Attention, Globetrotters. Suit up and become the Super Globetrotters. Nate: Why? It’s just a basketball game. We’re the Globetrotters. This’ll be a piece of sweet cake! Crime Globe: Ah, no. Come on, guys, how many times have we done this? The bad guys are going to cheat and whoop your butts throughout the first half, then I’ll have to tell you that you can’t win this game as regular Globetrotters, then you’ll have to became superheroes to defeat them. So how about this time we skip all that and cut right to the chase?? Crime Globe: It happens every week. What’s wrong with you?! It’s just like that time you guys met Snow White; you were playing against the Wicked Queen’s living gargoyles and of course the Queen used black magic to beat you, so at half time you finally got the bright idea that since you’re the flipping HARLEM GLOBETROTTERS, that you should be using your exhibition tricks to win, like you should have been doing at the beginning. So go super, now! Crime Globe: GET IN THE @#$%ING LOCKERS ALREADY!! If you really want to save the world, stay on the courts and leave the super-heroics to the professionals. Back off our racket or we’ll make arrangements for you to have to start dragging around 2 annoying teenagers and a stupid dog in a cape. And that put an end to the practice of basketball stars doubling as superheroes, at least until Shaquille O’Neal took the role of Steel. And we all saw how well that turned out. The Retro Box: Saturday Morning Jock Jams | Twinsanity!